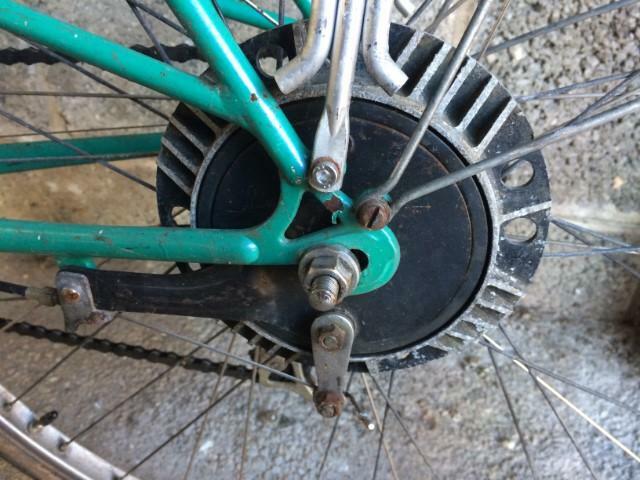 How to I remove and then refit the back wheel on our tandem when it is fitted withone of these brakes please. I think it is an Aria brake. Please see the picture. Disconnect the cable from the brake arm (bottom of picture). Disconnect the black arm from the frame (connects somehow to the lug on the chainstay - left of picture). This can be fiddly depending on the bolt used as you may need to get access to a nut on the inside of the chainstay. I cannot see from the picture exactly how that arm is bolted to the lug but it should be removable. It also looks like the outer cable stop is part of the lug - not visible in the picture. Then removal of wheel is same as normal. Release any rim brake, slacken axle bolts and wheel should drop out (in theory). And the famous words...refitting is the reverse of removal! But keep the picture as a guide for things like which side of the frame lug the black arm sits and how the cable is run. Hi, I've the same set up on our recently purchased first tandem, an 80's dawes super Galaxy (the pic looks to be the same?). I removed the rear wheel just to work out how it was done in the event of a puncture and did same as above and thought this is such a faff I must be missing something? But obviously not! Getting the wheel straight again is also awkward, as the frame does not have alignment screws in the back of the dropouts, which vintage frames often have. I can see it's very important to fit the most puncture resistant tyres possible to avoid this procedure on the side of the road!